Most of us patriots who have researched the Conspiracy for years and even decades are fully aware of the evil done to us by the elites and the even greater evil they have planned for the near future. We know about the rigged wars and depressions, the assassinations and false flag acts of mass murder. 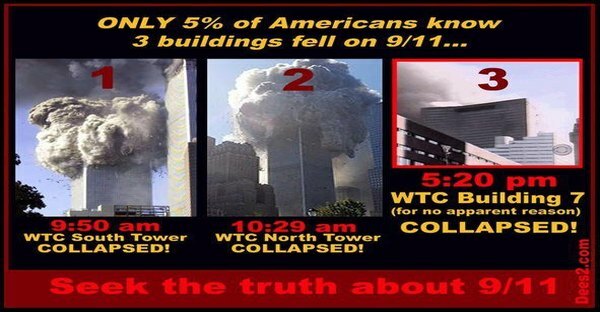 We know that in all the history of steel-framed buildings not a one ever completely collapsed due to fire…until 9/11 when three of them collapsed, straight down into their own footprints, a feat attainable only with carefully planned controlled demolition. We also know about the absence of a plane, its passengers, and crew after an airliner allegedly hit the Pentagon. Even the wings and engines vanished, after failing to damage the Pentagon walls. We know about Hussein Obama’s phony birth certificate, the various staged mass shootings in recent years, and the massive Demoncrap vote fraud. All this evil and more the elites have done…but what of the good they have prevented? We never think about the world that might have been, had it not been for the NWO conspiracy. We all hate the IRS, and we detested that agency even before the incredibly arrogant IRS official Lois Lerner was questioned by Congress…but never punished for her crimes, because there is never any accountability in America now, nor anything remotely resembling justice. We resent not only being bled white to fund welfare giveaways to lifelong parasites and even bigger payments to the parasites known as politicians, judges, and bureaucrats. We resent having to fill out lengthy, complex, and confusing tax forms and we resent living in fear of an intrusive agency fully capable of railroading innocent civilians into prison. But the federal income tax is only part of our tax burden, much of which is hidden from us. In some states citizens must pay a state income tax. Everywhere there are sales taxes. Whether you own or rent, directly or indirectly you pay property taxes on your home or apartment. You paid taxes on money for house payments as you earned it…and now you must pay the government merely to continue living in your home. Effectively, you are paying rent to the government for the home you paid for to begin with…in a very real sense you do not really own your home at all. If you buy groceries, you are paying, embedded in their cost, the property taxes and various sales taxes paid by the farmers, the food processing companies, and the supermarket chain. Leftists clamor for an increase in corporate income taxes to soak the evil rich, don’t you know…except the corporate CEOs do not pay that tax from their own salaries. It is passed on to the consumers, so you pay it, just as you pay for everything. This is true of everything you buy; prices are inflated by taxes, so you pay these taxes without even being aware of it. Woody Wilson gave us the IRS with the 16th Amendment in 1913, and also the Federal Reserve, via the Federal Reserve Act of 12/23/1913, a consortium of private banks in league with the government. 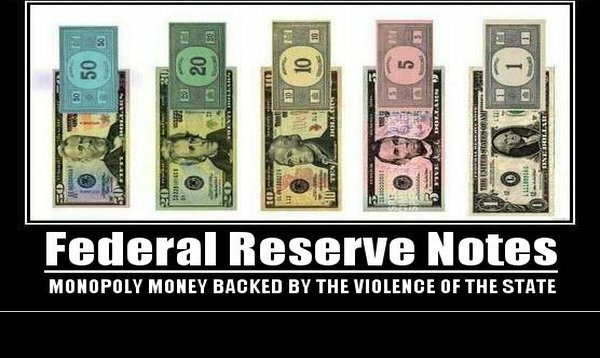 Incredibly, they are allowed to create money out of thin air, fiat money, which is legalized counterfeiting. No wonder there is a small elite of incredibly wealthy people…who wouldn’t be rich if allowed to counterfeit legally? They also get to set the interest rates, so they know in advance what is about to happen with the economy, and this is information they can leak to favored cronies, including currency speculators like George Sauron. This legalized counterfeiting inflates and devalues the currency; it is yet another hidden tax, and no one knows what it costs us. Conservatively, I can estimate that the average American, counting all the open and hidden taxes together, pays well over half his income without even knowing it. Imagine our lives if we had been allowed to keep most of this income, to spend or invest as we choose. Ironically, if the Treasury Department did, openly and subject to strict controls and limitations, what the Fed has been doing, it would at least be a non-intrusive means of financing the Federal Government. The government could do away with the IRS and simply create a limited amount of fiat money. This would cause a permanent inflation of our currency (which we have anyway), a tax on all of us, but done above board. We would never have to fill out tax returns, budget for payment of taxes…or live in fear of the power of the IRS. Not satisfied with bleeding us white with hidden taxes, the elites have engineered wars and depressions that have impoverished millions and wasted lives and treasure. There is ample historical evidence that WWI, the Communist Revolution in Russia, WWII, Korea, Vietnam, and the Cold war were deliberately engineered by the elites. Pseudo-sophisticates and half-baked phony intellectuals like to say that wars are good for the economy since they stimulate more spending. Those of us who believe in private enterprise would argue that government spending always does less good than private investment guided by the invisible hand of the marketplace. But, aside from that, how does it benefit the economy in the long run to send steel ships to the bottom of the sea and bomb industries out of existence? Suppose, instead, that the money wasted on eternal wars had been invested in our nation’s infrastructure. We would be in a far better position today. As to rigged depressions, how many have noticed that the Great Depression of the thirties, the worst in our nation’s history, happened after the Federal Reserve was established, supposedly in large measure to prevent depressions? And while millions were impoverished, a handful of wealthy and powerful people actually profited from the Great Depression, acting as if they had advance knowledge of what would happen. And this concentration of more and more wealth in fewer and fewer hands has continued ever since, further distorting and undermining the economy. And it has been distorted even more by massive fraud and waste in entitlement programs and by foreign aid, which is clearly unconstitutional to begin with. It has been said that foreign aid takes money from the poor (the working class) in a rich country and gives it to the rich in a poor country. Of course, some foreign aid is in the form of “loans,” not grants. These “loans” are usually guaranteed by the US government, so they are risk free for our banksters, who collect interest until the Third World dictator defaults, and then the US government (us taxpayers) “refunds” the principal to the banksters. That’s quite a racket…it is no wonder that our “compassionate” banksters are in favor of foreign aid. And the Western elites invariably support unlimited immigration from the Middle East and the Third World, orchestrating the invasion of their own countries by fanatical Muslims and unskilled, illiterate criminals and terrorists. Europe may already be past the point of no return, as “refugees” bleed the Western nations white with their consumption of various welfare benefits, and, to show their gratitude, commit nonstop crime and frequent terrorist acts. Anyone suggesting that maybe this insanity is, well, insanity, is denounced as a “racist,” the designated conversation stopper regularly used by leftists, who are incapable of debate. As if all of this was not enough, there is some evidence that the elites have suppressed or at least largely ignored and failed to develop promising alternative technologies that might have transformed our world for the better. Aside from natural treatments for cancer, this would certainly include “cold” fusion, which may not be fusion at all. In fact, cold fusion experiments have generated unexplained excess energy and this has been duplicated in several laboratories. By contrast, hot fusion research, after two generations and billions spent on research, has not reached the breakeven point. An American inventor named Thomas Townsend Brown may have developed a form of gravity control an incredible 80 years ago, and this may also be the key to “free” or virtual energy. Imagine a world and an America where there is no national debt or budget deficit, and no IRS. Imagine the currency being stable, with no increasing inflation. Everyone would have more real income and be more secure. With no arrogant, intrusive IRS our lives would be less stressful. The US currently has a population of over 330 million, but this is due to immigration and the high birth rate of immigrant and welfare families. Without all this, our population would have stabilized decades ago at perhaps only 200 million or so…less traffic, less pollution, less crowding, and less strain on our resources. With no immigrants competing for jobs, the average American worker would enjoy higher real wages and benefits, and there would be little unemployment. Absent the evil machinations of the NWO elites and their activist judges who rule us by decree, there would be far less crime. Even if we still funded public schools, they would, indeed, be schools, where children are educated, not dumbed down, morally degraded, and indoctrinated. This is the kind of world that is rightfully ours…and it has been deliberately stolen from us.